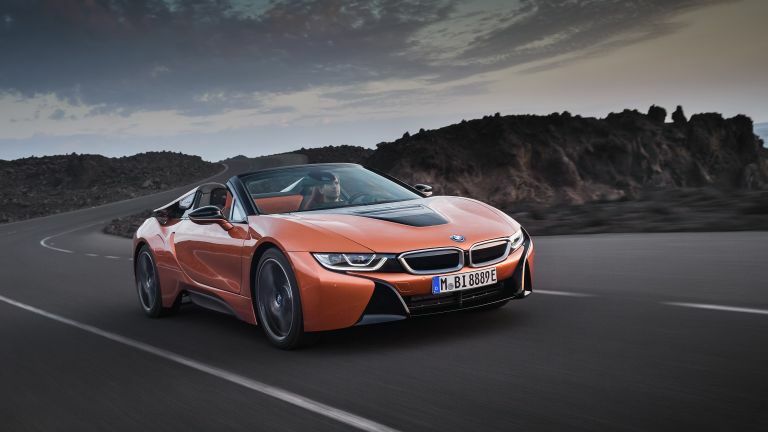 BMW has just taken the wraps off its latest generation of hybrid i8 supercar in the form of the new i8 Roadster. The company has also taken the lid off the i8 — literally, without losing any of the stunning futuristic good looks. In fact, the i8 may even look better as a convertible. Getting the wind in your hair is all well and good but how blisteringly fast will that wind be flying by? Well, you won’t be able to run the automatic roof back too fast as it's limited to operation at 31 mph and under, and it takes 16 seconds to fully open or close. Of course, this is the first major change over the coupe as this mechanical roof means the i8 Roadster has no back seats. All that also means a new rear window, new engine cover and new frameless doors that add up to a seriously drool-worthy machine. But how fast is it? When we say this beast is packing a 1.5-litre engine it might not sound impressive but bear with us. That inline three, six speed engine is turbocharged to output an impressive 228 horsepower. Of course, it is also coupled with the electric drive system at 141 hp that brings that total power output to a respectable 369 horsepower. All that adds up to a 0-60 mph time of 4.4 seconds, placing it just behind the seat-toting i8 Coupe which does it in 4.2 seconds. What the i8 Roadster does offer over the coupe in performance is range. On pure electric the new system can run up to 18 miles over the previous 15. It also runs more silently than the coupe, too, if that’s an appealing factor for you. The new BMW i8 Roadster will be available from spring 2018 with pricing yet to be announced.